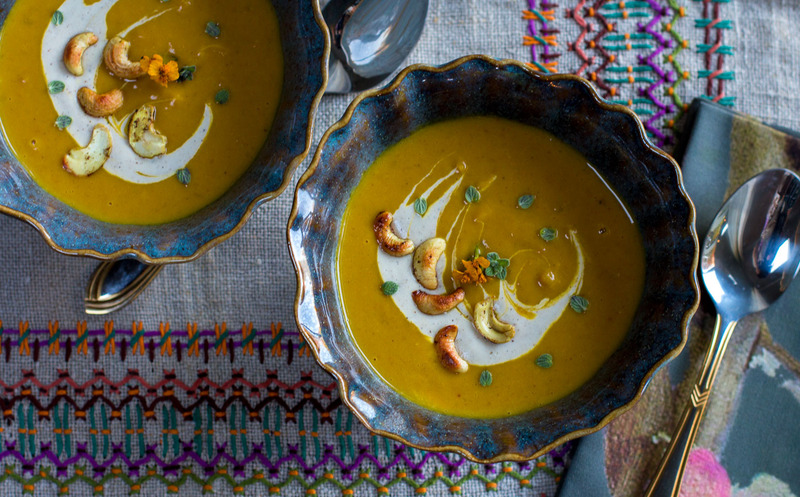 THE Thanksgiving soup to make and enjoy. See my easy way to peel a Kabocha Squash. You’ll love the Cashew Crema with hints of maple & cinnamon ~ the Spiced Cashews make a terrific, crunchy garnish. Thanksgiving is a holiday in which we can reflect on what we’re thankful for, contemplating gratitude and appreciation. As families gather for what can be ‘the largest meal of the year’ – tastes and dietary changes are becoming more apparent. 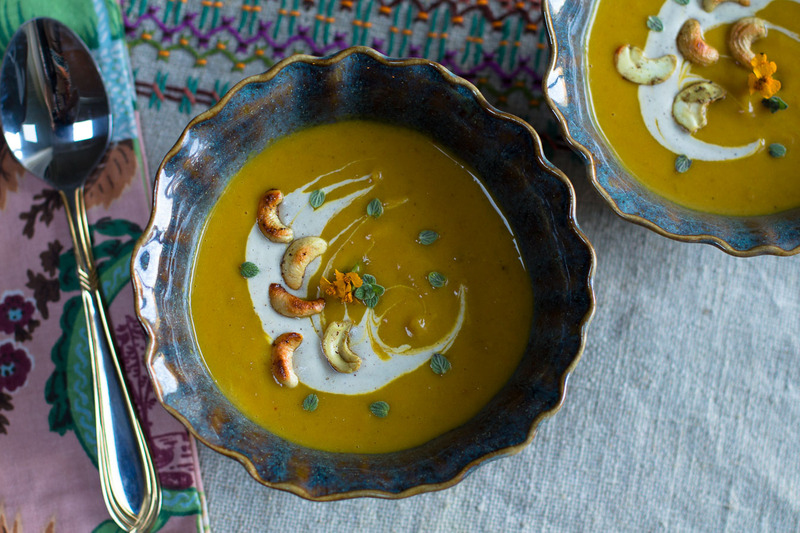 I tested this soup with these changes in mind – Will there be vegans at my table? Regardless, this soup is heavenly and delicious! 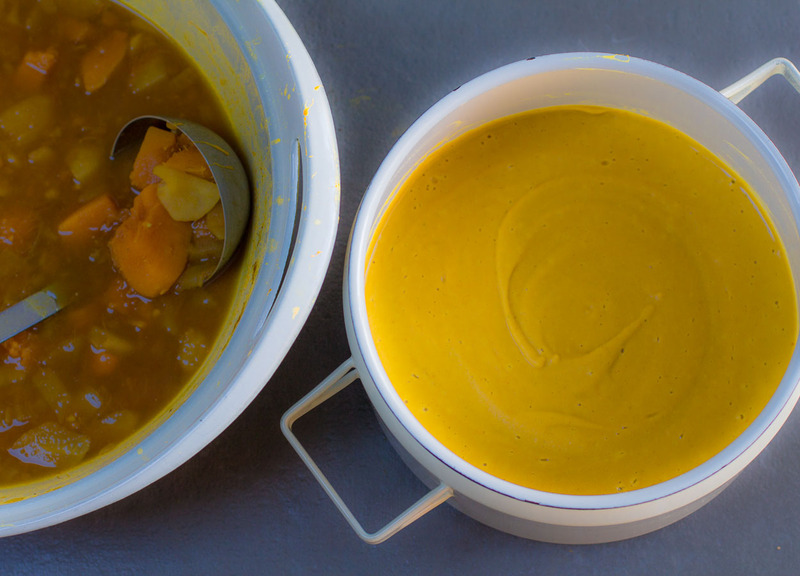 Kabocha Squash has a sweet taste, velvety texture – perfect for soup. I pumped up the apple flavor using my favorite apple – macoun, and added fresh apple cider to the pot. 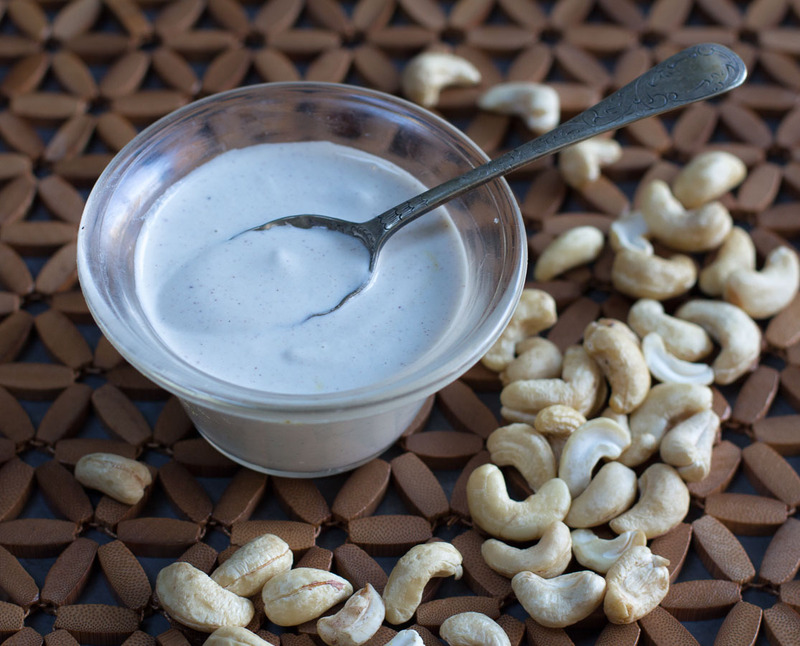 Soaking raw cashews, then blending the mix creates a creamy, diary-like texture and delivers a wonderful texture and a slight nutty flavor. 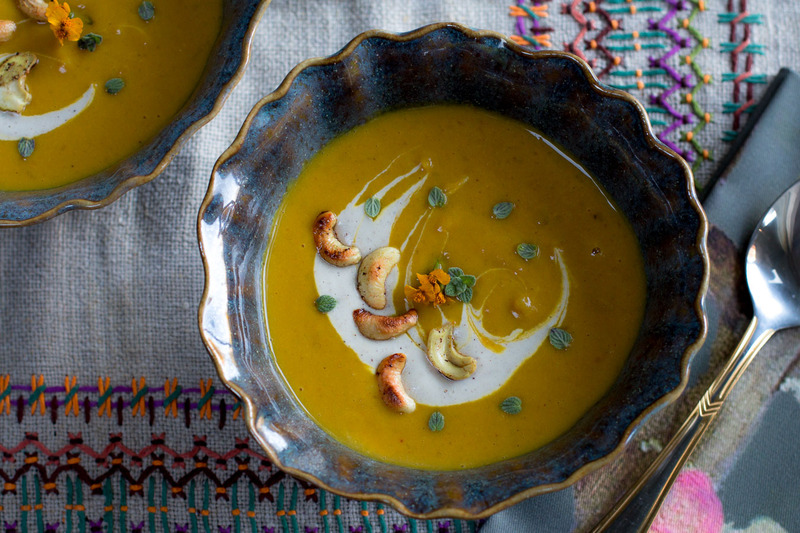 Make my Cashew Crema – a garnish for the soup jazzed up with soaked cashews, apple cider vinegar, coconut milk, filtered water, maple syrup and cinnamon. Tastes better with more zest than heavy cream or sour cream! 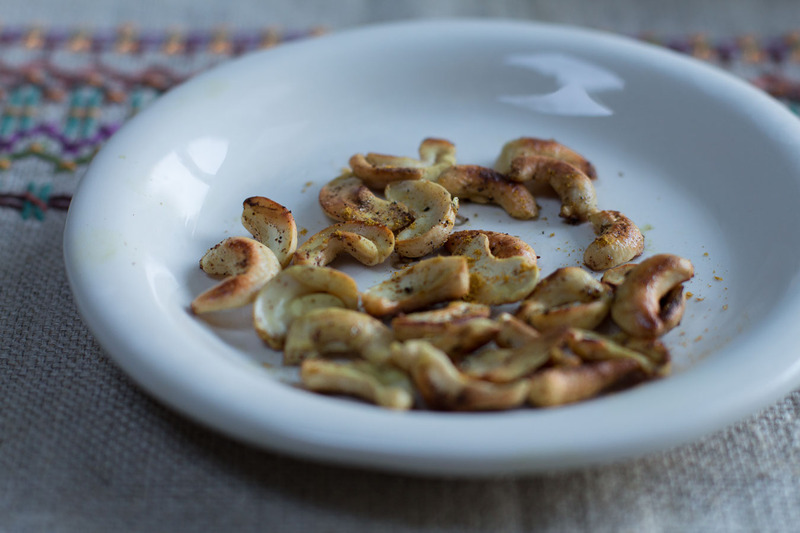 A quick little garnish – make my Spiced Cashews. Simple, no roasting in the oven necessary – Sauté raw cashew halves in a small skillet with a little coconut oil, then add spice mixes: curry powder and garam masala… and a pinch of sea salt. Adds a nice crunch, looks pretty and extends the cashew, nutty flavor. Once negatively associated with extreme health nuts and hippies, Veganism is shedding its label as vegetarianism’s fussy sibling and is coming into its own. 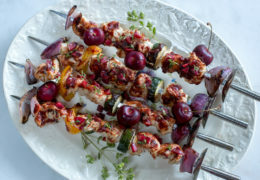 Dedicated to animal-free, health-conscious eating and said to increase longevity and vitality. Called Japanese pumpkin, kabocha began its history in Japan where it was favored for its sweetness and pleasing texture. Kabocha’s hard, deep green skin, boasts exceptional flavor to those who have had the pleasure of tasting its succulent, naturally sweet flesh. 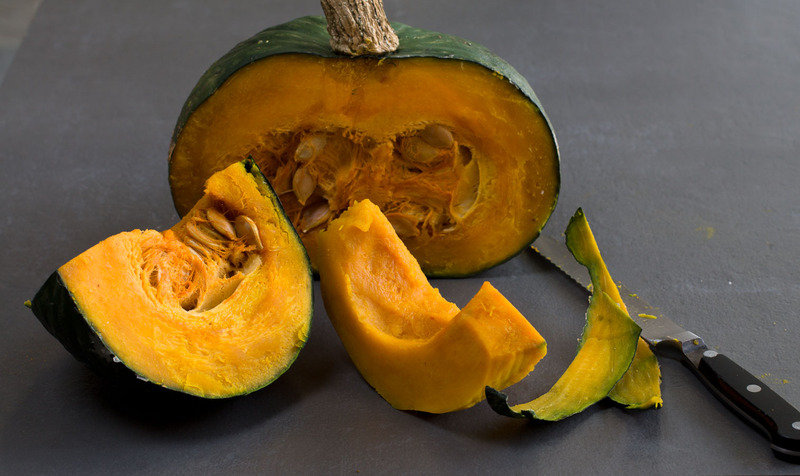 With its deep yellow-orange flesh this squash boasts a buttery and tender texture. 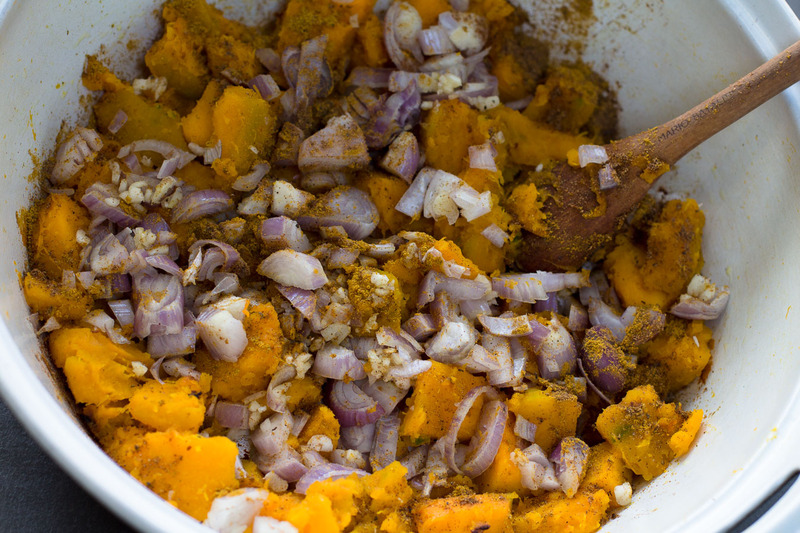 Rather sweet, its rich flavor combines that of a sweet potato and a pumpkin. 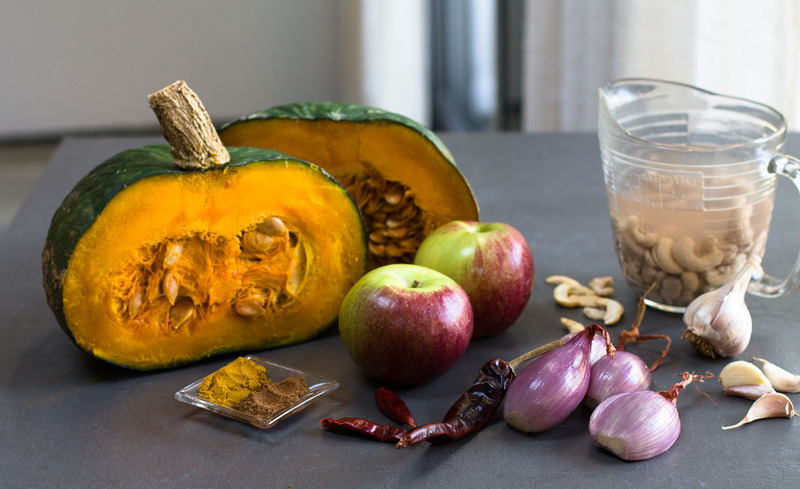 Kabocha squashes are available all year round, the best flavored ones are harvested in the late summer and early fall. Like many winter squashes, kabocha can vary in size with the average weighing two to four pounds. 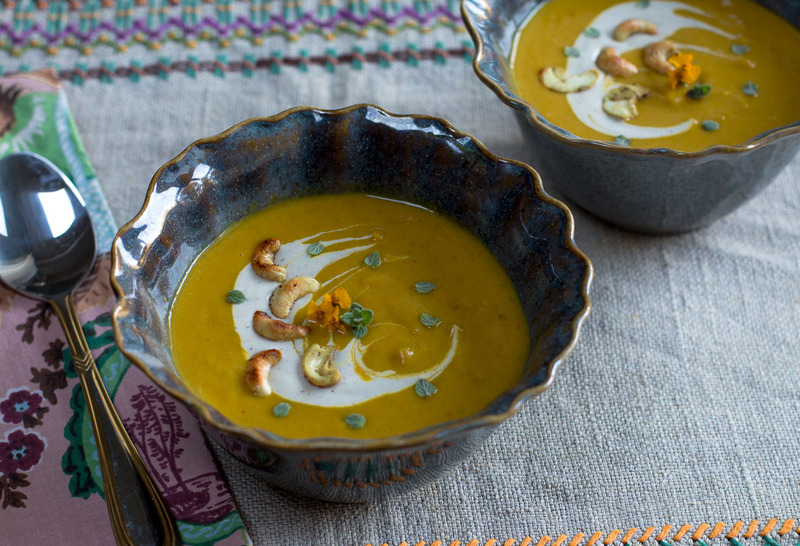 Spiced Cashew Garnish is easy to prepare in a small skillet… adds a nice crunch!